Rutland Boughton was born on 23 January 1878 at 18 Bicester Road, Aylesbury. His father, William Rutland Boughton, and his uncle, Cecil Ambrose Boughton, ran a grocery business (W. R. & C. A. Boughton: Tea Dealers, Family Grocers and Provision Merchants) at 37 Buckingham Street. Rutland Boughton attended Aylesbury Grammar School (then in St. Mary’s Square), leaving aged 14. 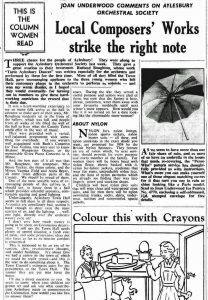 By now his interest in music was evident, and in 1892 his family placed an advert in the Musical Times which led to a job in a musical agency in London – staying first with his mother’s sister in Kilburn before moving into lodgings in Kensington. 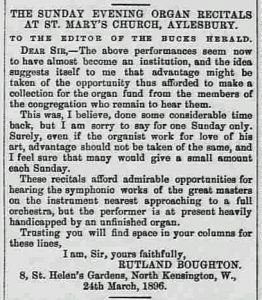 In 1896, the Bucks Herald published a letter written from his address there in which Rutland Boughton suggests that collections should be made at Sunday evening organ recitals at St. Mary’s Church in support of the organ fund. At around this time his compositions came to the notice of composer and conductor Sir Charles Stanford, who considered that he had talent and persuaded Aylesbury M.P. Lord Rothschild to help raise funds to send him to the Royal College of Music in London. 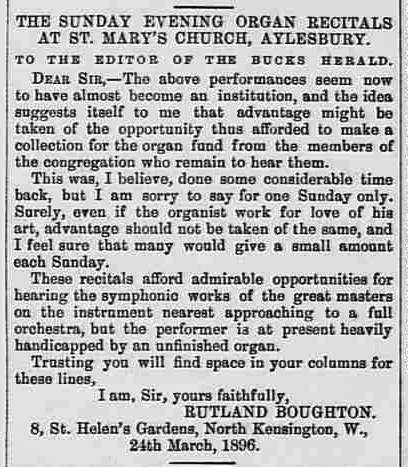 However the money ran out in less than two years and Boughton was forced to take a number of music jobs in London. In 1905 he secured an appointment at the Midland Institute of Music in Birmingham where he began to flourish as a composer of choral music, conductor, teacher and as a writer on music and social issues. There he also began to develop ideas for a specifically English type of opera which he called “Choral drama”. These ideas came to fruition with the founding of a commune of artists in Glastonbury in 1912 and the founding of the Glastobury Festival in 1914. Boughton’s masterpiece The Immortal Hour was first performed in Glastonbury on 5 August 1914 – the day after the outbreak of the First World War. 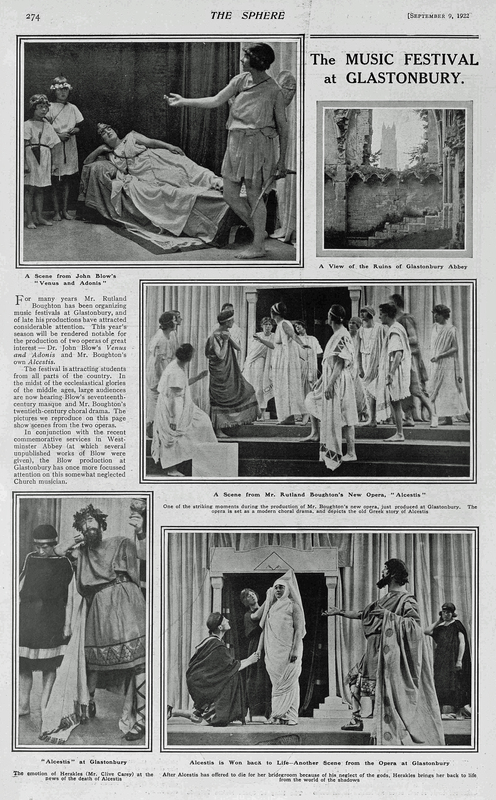 The opera was eventually staged in London at the Regent Theatre, Kings Cross, in 1922. It ran for 216 consecutive performance, a world record, and was revived in 1923, 1926 and 1932. The Glastobury Festivals continued until 1926 – the year of the General Strike, when Boughton’s work entered a more controversial stage. A committed socialist, Boughton held a passionate belief in the power of music to encourage new thinking. 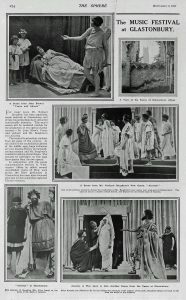 In 1926 he sided with the Miners’ Lockout during the General Strike and staged his nativity opera “Bethlehem” in modern dress with the baby Jesus born in a miner’s cottage and King Herod portrayed as a wicked capitalist. This led to withdrawal of sponsorship and support for the festival in Glastonbury. Boughton moved to a village near the Herefordshire and Gloucestershire border where he lived for the rest of his life. There he continued composing his Second and Third Symphones, concertos and chamber music, and finally the last parts of his cycle of five operas based on the King Arthur legend. 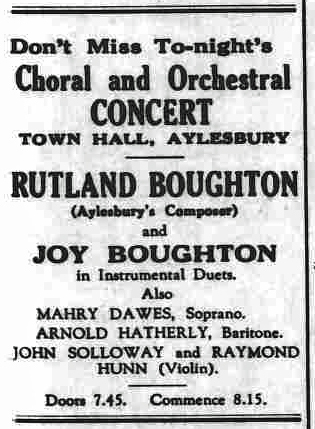 Rutland Boughton retained his links with Aylesbury through his friendship with Charles Pope, a central figure in the Aylesbury music scene. 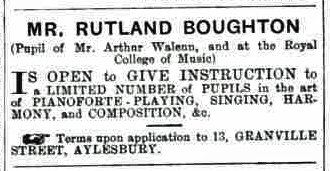 Pope was music master at the Grammar School and founded the Aylesbury Choral Society in 1932. 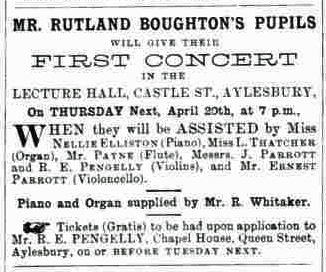 Charles Pope also founded the Aylesbury Symphony Orchestra and the Aylesbury Consort of Voices. 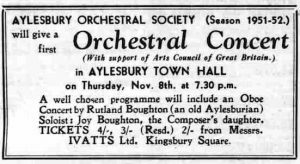 In 1952 Boughton completed a work entitled Aylesbury Games, inscribed with the words: Written in the first place for my friend Charles Pope and the orchestra of Aylesbury, my native town. Writing in the booklet for the CD release of Aylesbury Games on Hyperion Records in 2000 Boughton’s biographer Michel Hurd wrote that Pope thought that the challenge of playing the piece was beyond the reach of his orchestra at the time, and it was not until 22 April 1978 that he felt able to tackle a first performance – and Boughton therefore never heard his music played. 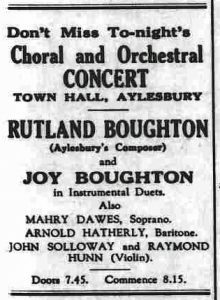 An article in the Bucks Herald dated 20 March 1953 shows that a work entitled “Three Aylesbury Dances” was performed at the Town Hall in Aylesbury, with Rutland Boughton in attendance. It is not clear whether this was the same work, or something different. Charles Pope died in 1982 and is remembered through the Charles Pope Memorial Trust which offers grants to support music students in the Aylesbury Vale district. Rutland Boughton’s daughter Christina Joyance or “Joy” Boughton (1913-1963) was one of the most accomplished oboists of her generation. She performed a number of times in Aylesbury. 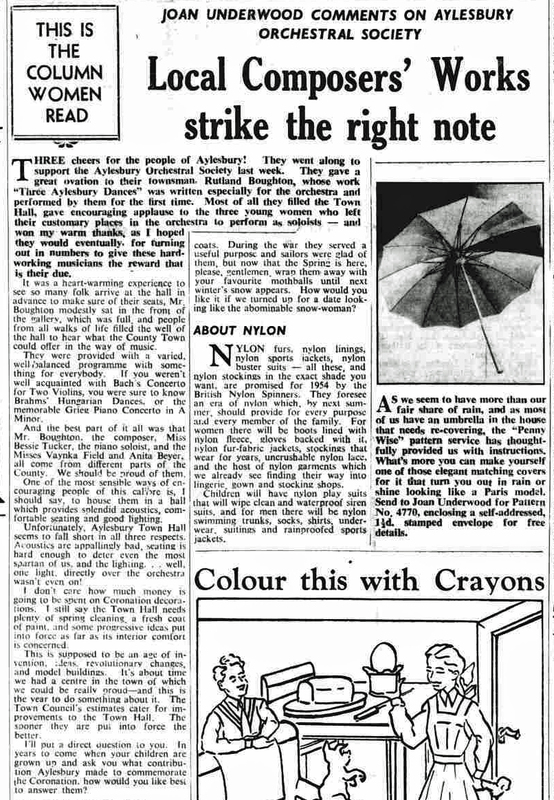 In December 1936, she appeared at a concert presented by the Aylesbury Choral Society. Her father, President of the Society, was present foe the performance. 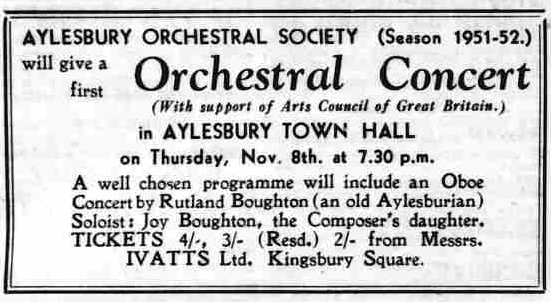 Later in 1951, Joy was the soloist for a performance of Rutland Boughton’s Oboe Concerto at the Town Hall. As my mother’s maiden name was Rutland, I was interested to know about the distinct first name. It was a family name inherited from Ambrose Rutland, a farmer in Newton Longville who died in 1765. His daughter, Ann Rutland, married John Boughton (1772-1838), the composer’s great-grandfather. The name has persisted in the Boughton family – his father was William Rutland Boughton and his grandson, Ian Rutland Boughton, has been most helpful in providing information, and gave a talk on his grandfather at the Buckinghamshire Historical Association on December 19, 2018.